During the summer of 2013, I renovated a one bed studio flat so it could be ready for rental. It had always been a cold space, as the property has three external walls with no cavity. To make it more efficient to heat, and a more comfortable space, I internally insulated the walls with insulation, build a stud work, and refitted plasterboard creating a new internal skin. Due to the old stud-work being rotten from a leaking shower, I had to completely rebuild the bathroom walls, incorporating glass blocks to allow light to pass between the different spaces. The original kitchen was small and cramped with no natural light, so I decided to remove this wall and create one open studio space. A new ceiling was fitted in the living room, (this took some help!) but to maximise space and create a feeling of separation between the eating and living spaces, I decided to vault the kitchen ceiling, cladding at the rafters. I fitted electric underfloor heating under the tiles in the kitchen and bathroom. Due to the insulation in all the walls and loft, and new double glazing throughout, the studio is incredibly energy efficient. LED lighting throughout and a instant hot water heating means energy usage is kept to a minimum. During my time working on this project, I researched and learned many practical skills: building work, bricklaying, plastering, tiling, carpentry, kitchen fitting, carpet fitting, decorating, landscaping and budgeting. With the exception of the double glazing, and the electrics, I undertook all the parts of the project. Below are some photos of the finished studio and of the renovation. 200 years old, and free to collect. Outdoor LED lights brighten up the alley to the studio, with a sensor at each end to automatically switch them on and off. Glass block DIY kit came with plastic channels to ease installation. An extended bathroom made space for a large shower tray. 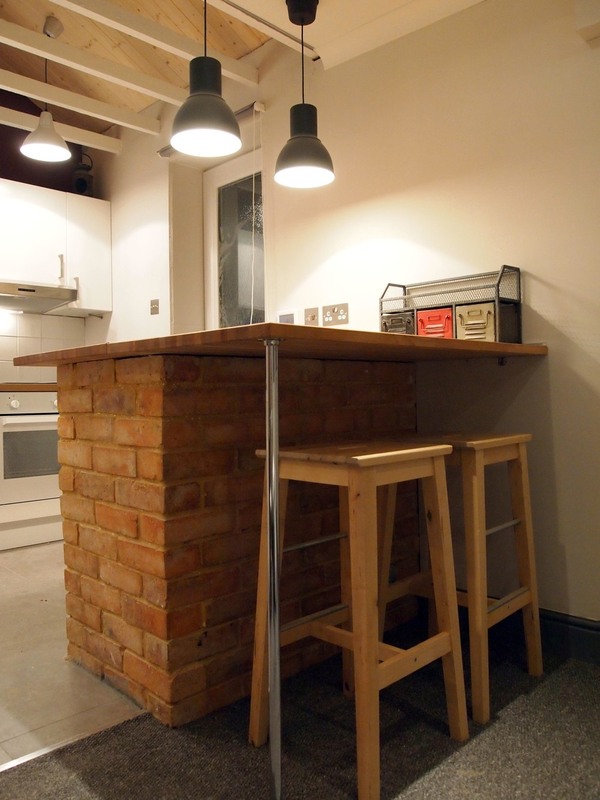 The brick built worktop hides the fridge and freezer, and provides a valuable double width work space to eat and work in the small studio space. Ikea kitchen utilises small space with a 2 ring induction hob to maximise worktop space. An integrated washing machine bought second hand on gumtree keeps the kitchen wall uncluttered. A compact bathroom fitted with reclaimed cistern toilet (£8!) and an old pine door. This wall was removed to make a more open space. A leaking shower meant all the bathroom stud work had to be rebuilt. Studs from the kitchen wall were repurposed in the new bathroom, alongside new beams. The old ceiling didn't need much persuasion to come down! All the loft insulation was rolled and bagged up, new ceiling fitted, and insulation reused and topped up. Most of the plumbing was reused, with the gas connection for heaters professionally capped at the outset, and copper pipes sold for scrap. The studio is exclusively electric heating. Not as easy as I first thought it would be! Glass blocks were fitted in a bespoke wooden stud work so they would be flush with the tiles in the shower, and flush with the plasterboard in the living area. Electric underfloor heating was simply rolled out and fitted in kitchen and bathroom, before being tiled over and hooked up by an electrician. This is the only heat needed in the studio to keep a comfortable temperature due to the insulation. A new toilet cistern was attached to painted wooden paneling to configure with the old drainage. Internal insulation was fitted around windows and doors, sealed at the joints, before been battened and plasterboarded. The joints were taped filled, and sanded to give a seamless(ish!) wall before painting. Ivy was scraped back and pathway pressure washed.